Caving, also known as potholing, is viewed by many with apprehension. For some, it calls to mind grisly horror films and devastating news stories. If practised with care, however, it can prove a highly rewarding hobby combining the pleasures of physical exercise with an interest in natural history and the excitement of the unknown. Caving is a rural sport which involves exploring cave systems. These are usually wild and non-commercial but there are a few exceptions. 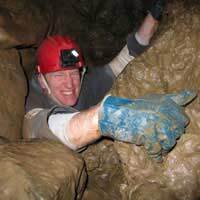 Cavers need to negotiate the space of the caves they are exploring and may need to deal with obstacles such as water. Many cavers have a keen interest in science and particularly enjoy visiting previously unexplored or ‘virgin’ caves, which may necessitate diving or digging. Those with no experience of caving should expect to do a great deal of climbing and crawling and should know that ropes are used to negotiate the more difficult areas of a cave system. Caving can be an extremely muddy sport. Indeed, this is one of the key attractions for those keen to experience the untamed, natural world first hand. The correct equipment is perhaps the most important aspect of caving. Hard hats must be worn at all times. These hats are usually mounted with a strong light for visibility. Most cavers will carry two lights, one as their primary light source and another as a backup. The sort of clothing worn is dependent upon the environment of the cave at hand. For example, wet suits may be worn in especially wet areas and fleeces may be worn if the temperature is low. Knee pads and elbow pads protect cavers when crawling. Gloves, too, are often adopted to guard the wearer against friction or chilly conditions. Ropes are a must for navigating a cave system and ladders are sometimes used too. It is advisable to carry a first aid kit, along with emergency food and water supplies. Many cavers also carry containers for transporting excrement from the cave, especially on longer trips. Potholing is a particularly athletic activity. Indeed, physical exhaustion is one of the main risks of caving and the sport should only be undertaking by fit individuals who are in good health. If you suffer from claustrophobia it's not the sport for you. Cavers are also at risk from hypothermia and flooding. As such, appropriate clothing should be worn and cavers should be alert for any signs of water. It is also advisable to inform someone outside of the cave of the group’s intended return time, so that rescue services can be alerted if a problem arises. Cavers should stay vigilant and work hard to memorise the route out of the cave. Non-permanent markers such as tape can also be used to avoid getting lost. Just as many are drawn to remote, unpopulated areas of the countryside, unvisited caves are approached with excitement. Those with a real passion for the countryside and rural sports are likely to enjoy exploring unknown areas of scientific and natural interest with likeminded individuals.